The Particles Plus 2310-1 Remote Particle Counter measures 0.3 μm and 0.5 μm with a flow rate of 1.0 CFM (28.3 LPM). Integration is easy into a real-time monitoring or building management system via Modbus™ RTU or ASCII. The 2000 Series is the smallest remote particle counter in the market and has easy mounting options. The Particles Plus 2310-1 complies with ISO 21501-4 and includes a 2 year limited warranty. The Particles Plus 2310-4 Remote Particle Counter measures 0.3 μm, 0.5 μm, 1.0 μm & 5.0 μm μm with a flow rate of 1.0 CFM (28.3 LPM). Integration is easy into a real-time monitoring or building management system via Modbus™ RTU or ASCII. The 2000 Series is the smallest remote particle counter on the market and has easy mounting options. 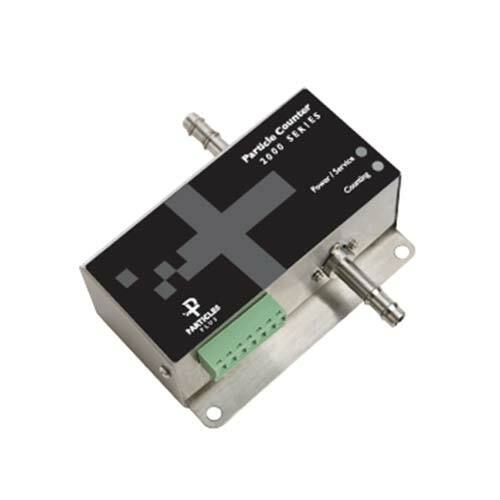 The Particles Plus 2310-4 complies with ISO 21501-4 and includes a 2 year limited warranty.